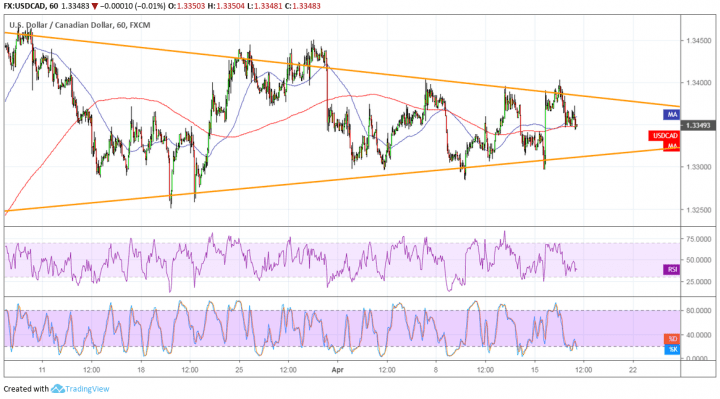 USDCAD has formed lower highs and higher lows to consolidate inside a symmetrical triangle pattern on its 1-hour time frame. Price has bounced off the resistance and might be aiming for support again. The 100 SMA is above the longer-term 200 SMA to signal that the path of least resistance is to the upside or that support is more likely to hold than to break. These moving averages also seems to be holding as dynamic support in the middle of the triangle also, possibly leading to a bounce back to the top. RSI is on middle ground to reflect consolidation while stochastic appears to be pulling up from the oversold region. This could signal a pickup in bullish pressure that might take the pair for an upside break. If that happens, USDCAD could be in for a climb that’s around the same height as the chart formation. This triangle spans around 1.3250 to 1.3450, so the resulting climb could be 200 pips. Similarly a break below the triangle bottom at 1.3300 could spur a drop of the same size. The Loonie is once again drawing support from rising crude oil prices as a surprise draw in stockpiles seemed enough to ease oversupply concerns. OPEC meetings are scheduled towards the end of this week, though, so there could be some volatility in the days ahead. Keep in mind that Russia is questioning the production agreement as it negatively impacts their market share versus the US. As for data, Canada’s CPI and trade balance numbers are due, so additional volatility could be expected. Stronger than expected results could assure traders that the BOC won’t be cutting rates in the near future while huge disappointment could ramp up easing concerns as well. On Friday, the US and Canada will be releasing their retail sales figures.